From our neighbors over at the Origami Footwork blog. 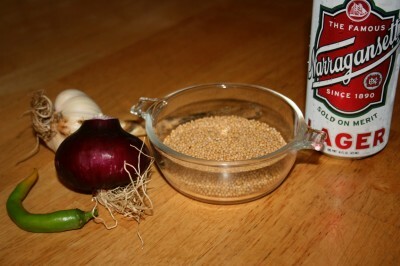 Here’s a really simple recipe for beer mustard. Pour some mustard seeds into a container. Fill the container to a little over double with your favorite beer. 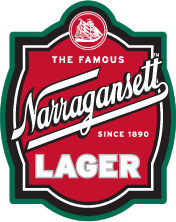 I have 100ml of mainly yellow mustard seeds and filled the container to about 235ml with Narragansett Lager. Let it sit in the fridge overnight so the seeds can drink up all the beer. Also, you can spend the night drinking up the rest of the beer. Twenty four hours later, use a stick blender or put the mustard seed mixture into a food processor. Add anything you want. I went with half a clove of garlic, a quarter of an onion, and half a cayenne. Horseradish and cumin are good, too. Add a splash of apple cider vinegar and salt and pepper before mixing. Cover it up, and leave it in the fridge for a few days to let it mellow (fresh mustard is VERY hot).